Here i am with this weeks haul, its not a huge haul but there is a few new bits and bobs which i have been eager to try out. 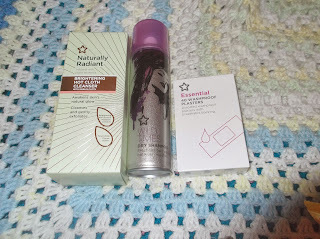 After i have used the products for a month i plan on doing a post on some of the products. This weekend i did try to be really good with money but i ended up spending a little more than i planed. This weekend i finally sent my car to the crusher, i have been meaning to do this since i started my new job as i don't need the car any more to travel to work. I barely used it anyway it was only when i wanted to pop to the shops. After buying three new tyres last month i finally had to face facts and let poor Xavier go. I do feel a little stranded without a car now as i have had a car since i have been 17 but i live pretty close to the city and the exercise of walking will do me good. It is my last weekend in Sheffield before Christmas so i planned on watching lots of Christmas films to get me super excited about going home next weekend. I still think its a little too early to watch Elf and The Grinch but is is perfectly acceptable to start watching home alone and love actually. On Friday as it was Christmas jumper day i wore my new jumper. I did get a few funny looks on the bus and at work for my jumper but I'm guessing thats because they thought it was pretty cool and wanted one too. I had multiple comments on saying how cute it was and asking me where i had brought it from. It was from Primark and it was £8.00, it a bargain. I think Primark is perfect for Christmas jumpers as you will buy one every year and you won't get that much wear out of it so it won't matter too much if it starts falling apart. 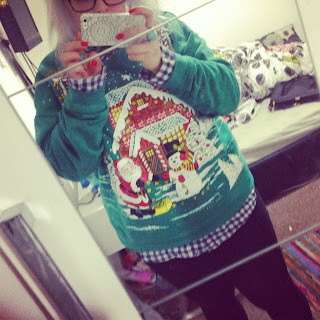 It is oversize as thats how i love my jumpers, i wore with with my lumber jack shirt and some tights. What do you think of the cheesy jumper, it does certainly have the cheesy factor! (Sorry for the mirror selfie). This was my super drug haul, i am a bit of a traitor to the drug stores. 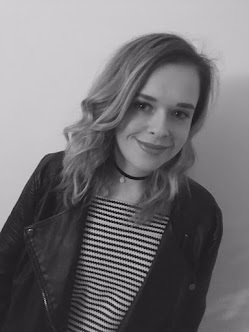 I tend to shop in both Boots and Superdrug. 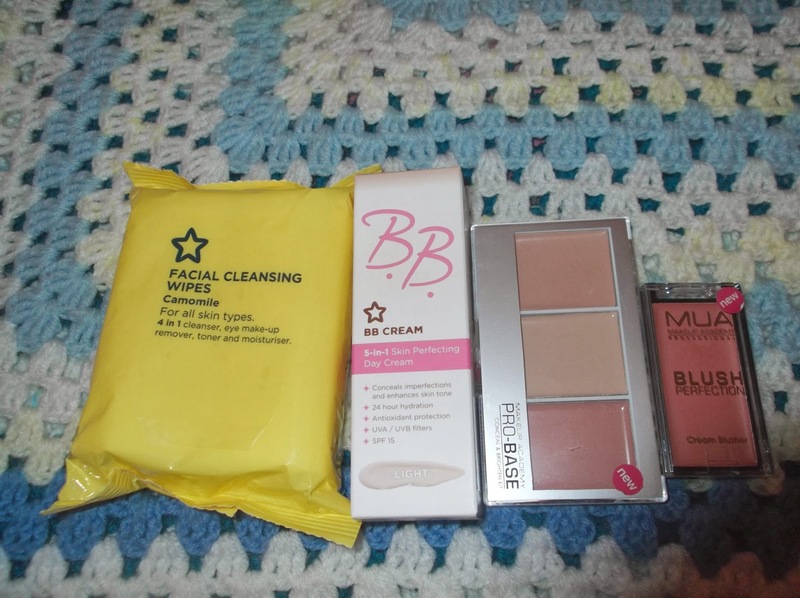 I love Boots for there 2 for 3 deals and i love Superdrug for there MUA make up. I tend to find if you use and abuse both you can get some really good deals. In Sheffield and in Nottingham they are really close by so can visit both in the same shopping trip. Facial Cleansing Wipes £0.99 I love the Boots own branded face wipes so these wipes have a lot to live up to. I only really use them when applying my make-up for when i make mistakes, or when I'm clumsy. BB Creme Light £4.66 I have ran out of my usual Nivea BB creme so i was looking for a new alternative. I find the Nivea is good but it does not last all day on skin so i need a long lasting one. MUA Pro Base £3.50 I have been eyeing this up for a few months now but after i discovered a few beauty bloggers reviewing it i thought i should give this a try for myself. MUA Blush Dolly £2.00 I have used the MUA blushers before and i have loved them, they all have been powder ones so i thought i would give this creme blusher a try. Natural Radiant Hot Cloth Cleanser £2.98 I love hot cleansers and i have almost used all of my Soap and Glory no clogs allowed so i thought i would give this one a try. It also comes with a muslin cloth which is handy as you never can have enough clothes and flannels. 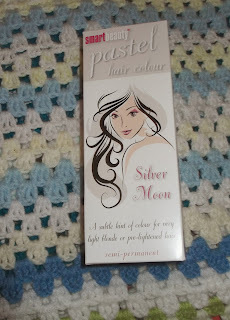 Superdrug Dry Shampoo £0.98 I have been using the Batiste Light but it has been sending my hair yellow. Im sure this would be fine if you had blonde hair and not silvery white like mine. As this was only 98p i thought it was worth a try for when I'm being super lazy between washes. Plasters £0.59 I need plasters badly, i have numerous pairs of shoes which i need to wear in. New shoes always rub my feet, i have no idea where but i am sure these plasters will put an end to that. Smart Beauty Pastel Silver Moon £3.99 This is from Savers, i have used this before and i have loved the silvery tones it puts into my hair. 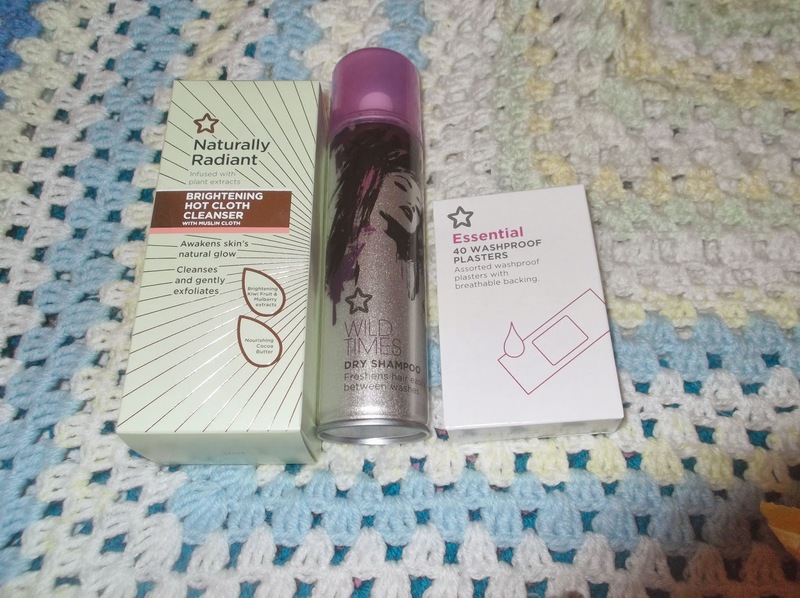 I have recently brought Bleach from Boots but i plan on using them over Christmas, i have a pink and a silver so i will be doing a post on them shortly. BHS Cardigan £3.99 This is from the help the aged charity shop in sheffield city centre. 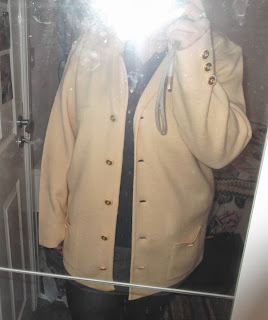 I love this as it is thick and i hate wearing coats as i tend to get too hot in them. This i thought would be perfect for chilly afternoons. 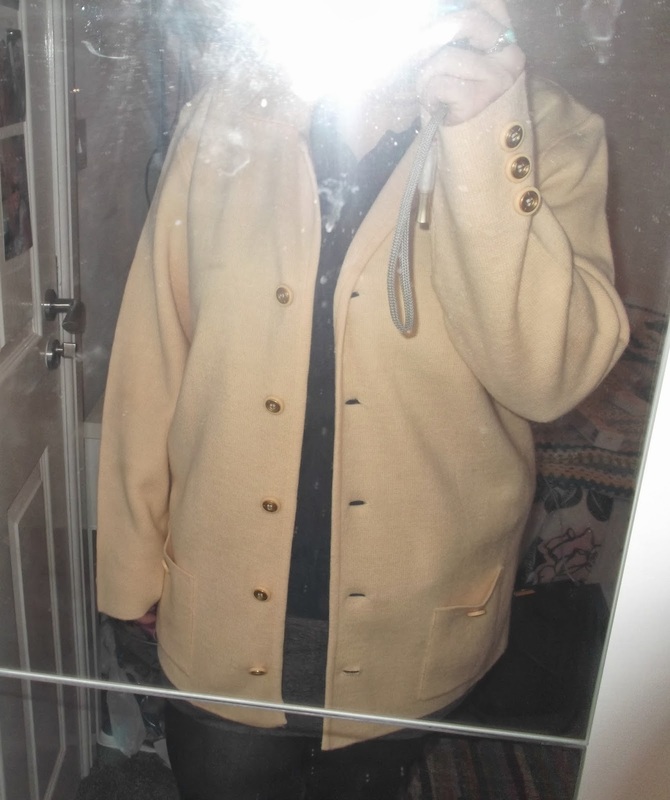 I am a little unsure about the buttons on this, i may change the buttons before i wear this one. It is currently in the wash and then i am going to see if it matches any of my outfits. I love the yellow colour of this i thought it would be a lovely colour for spring.